For those of you who’re browsing our blog from work, I’ll spare you the gore: I have extremely strange feet. They’re very wide, completely flat, and connected to ankles that bow inward. When I get out of the pool and step on the pavement, I leave a giant footprint; there’s no curve to it whatsoever – only a big, ugly plank. Shopping for running shoes was a crapshoot for me until spring 2012. I tried every major brand, and only once bought the same shoe twice – Mizuno Wave Riders. Despite my initial success with the Wave Riders, they didn’t stand the test of time, and I started to develop tightness in my calves. The pain was much less pronounced when I ran in stiffer trail shoes, Brooks Cascadias, and I was determined to find a stiffer, wider road shoe before I dove headfirst into Ironman training. 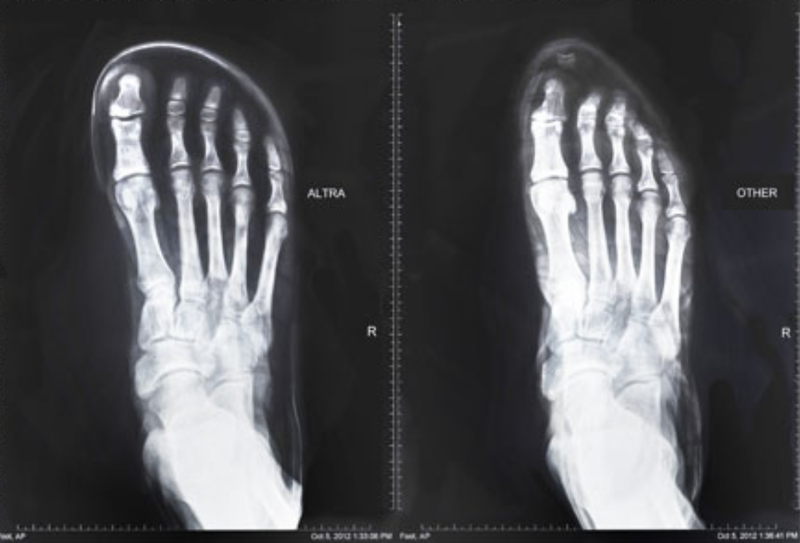 An x-ray of a foot in Altras (left) and conventional shoes (right). Taylor loves a good coincidence, and this anecdote goes down as one of my all time favorites. Fast forward to March 2012. I was finishing a long run and ascending the final hill leading up to Fort Mason when a guy with a very similar neutral strike and pace caught me. We chatted briefly, and he asked me if I’d ever heard of Altra shoes, pointing at the shiny new pair of Instincts he was sporting. I hadn’t, but was very intrigued; I saw that Altra offered a 30-day money back guarantee and free shipping (they still do! ), and my pair of Provisions was in the mail later that day. When I first put them on, it just made sense: Altras are the first shoe that fit my feet comfortably. The wide toe box gives my feet ample breathing room, especially during the dreaded long-run swelling. I ramped up to making them my everyday shoe by alternating runs with my old shoes. Only weeks after my first run, I posted a PR 12K at Bay to Breakers, and wore them for the marathon leg of Ironman Lake Placid. 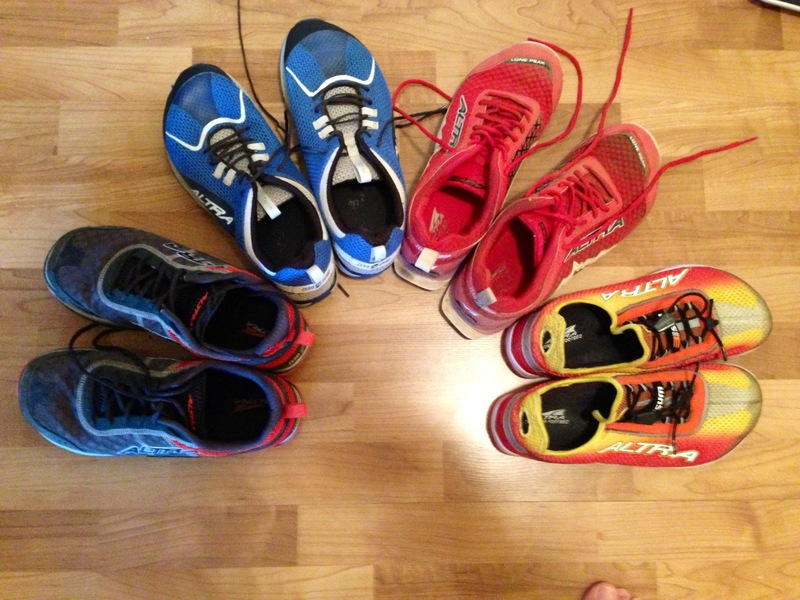 My Altra rainbow – from left to right: Instinct 1.5, Torin, Lone Peak 1.5 and 3-Sum. Since then, I’ve gone on to buy four more pairs in the past calendar year: Torins for road running, 3-sums for triathlon and speed work, Lone Peak 1.5s for trail running, and Instinct 1.5s as a replacement to the Torins’ (after hundreds of quality miles!). Each shoe follows the same core design principle – zero drop, which means that there’s no difference between the height of the heel and the forefoot. Zero drop proponents will tell you that keeping the forefoot and heel on the same plane results in increased stability, less impact, and proper running technique. I’ve noticed a major improvement to my cadence since making the switch, and I now emphasize driving with my glutes and hips more than I did in a conventional running shoe. To be clear, I’m by no means advocating zero drop for everyone – it works for me, and I’ve reaped the benefits of running in a similar shoe on both the road and the trail. If you’re one of the many runners in search of their elusive “go-to” shoe, I encourage you to avoid brand bias, find a shoe that conforms to your anatomy, and most importantly, lace up something that makes you excited to get out and run.